I cycled through Rioja in 2003, and thought it would be great a few years later when I could drink those wines that I’d seen growing around me after they’d spent years aging in oak and bottle. Unfortunately it was hot that year. Very hot, record breakingly hot. That wasn’t ideal for cycling across Spain from July into August as the hottest year on record led to forest fires on our route. It wasn’t ideal for wines either, it was just too hot to make great wine, so no-one really bothered saving the wine to be gran reservas. Never mind, that pain has passed and we’re into 2005 wines now. This Viña Eguía Rioja Gran Reserva 2005 from Majestic still sent my mind back to those days as the first sunny days of the year hit England and I looked to get my bike ready for the road. Rich and deep coloured,there was some evidence of bricking around the edges but still lots of life in it. It smelled of vanilla, rich, sweet smooth vanilla with just a little leather. It’s dry with a medium acidity and smooth ripe tannins that felt positively silky. The vanilla flavour carries through with a slight creaminess as well, almost dulce de leche. The fruit lives on though, with blackberry goodness doing all the hard work. There was a little leather too and something a little cough medicine like, but in an entirely good way. The alcohol level is at the upper end of medium, warming rather than burning. 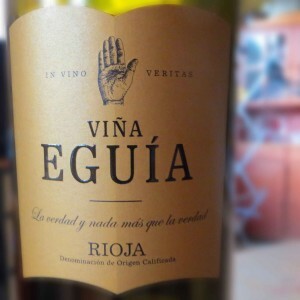 This wine is a good old fashioned Rioja delight. None of your new-fangled freshness or fruit forward light styles, this is smooth, oak-soaked creamy vanilla custard on blackberry crumble kind of good. Right now you can get a third off at Majestic online as part of a case which makes it cheaper than plenty of altogether duller generic Tempranillos or wines filtered through oak chips. I really enjoyed this as a big comfortable wine hug. I’m looking forward to autumn nights to enjoy some more.